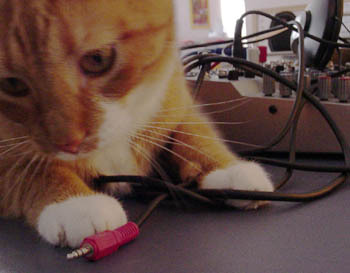 Purrfect Sounds is a free collection of submitted cat purrs to be downloaded for sound art and/or personal enjoyment. Please make a recording of your cat in a quiet location and email to me. Please send 44.1kHz, 16-bit mono recordings, and I will convert to .mp3 format. Please include the below information. I can include a link to an email or web address. By submitting a sound file you agree to allow anyone to download it and use the file for any purpose. 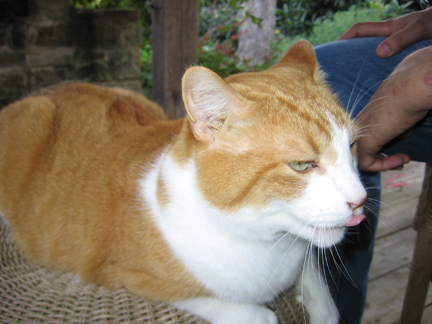 In memory of Max T. Cat, missing since June, 2007. Nimbu hilariously interrupts a performance of Cage's 4'33". 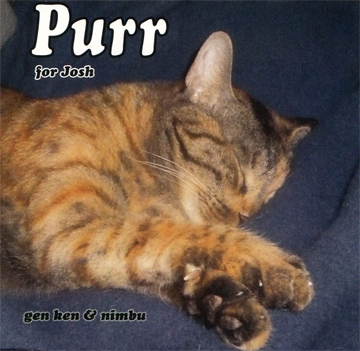 More cat sounds can be found here. brekekekexkoaxkoax • mail art • monk mink pink punk • frequency curtain • john cage links • austinnitus • gates ensemble • pierre boulez project • austin new music co-op • song olympics • dumitrescu & avram info • garnish off our plates!